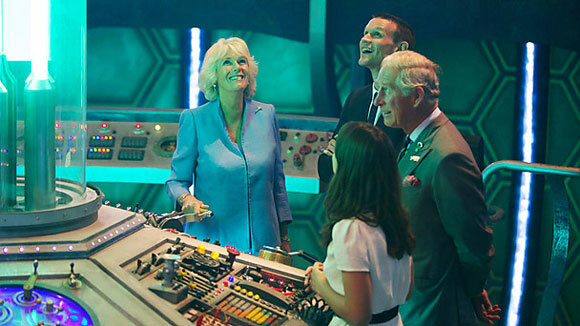 The Prince of Wales and Duchess of Cornwall are meeting Daleks and some of the cast of Doctor Who on a visit to the set in Cardiff. The royal couple are visiting BBC Wales’ Roath Lock studios on day three of their annual summer tour of Wales. They have come face-to-face with two of the Doctor’s most famous adversaries. On Monday the couple visited the last home of poet Dylan Thomas in Laugharne, Carmarthenshire, and on Tuesday held a series of engagements in north Wales. On Wednesday morning, they were greeted by BBC Wales director Rhodri Talfan Davies in Cardiff Bay – where Doctor Who is recorded – and then posed for pictures with two gold-coloured daleks. They are due to meet Matt Smith, who currently plays the Doctor but is stepping down, and Jenna Coleman, who plays his companion, as well as series head writer Steven Moffat. The tour includes the set of the tardis, the Doctor’s time travelling ship, as well as a display of some of the show’s monsters, including a weeping angel and a cyberman. Nicholas Briggs, who voices the daleks, will demonstrate some of their famous catchphrases, while production staff will show how a green screen set is used to generate some of the programme’s special effects. Doctor Who is celebrating its 50th anniversary this year. In addition to Doctor Who, Roath Lock is also home to BBC programmes including Casualty, the Welsh-language drama Pobol y Cwm and children’s drama Wizards vs Aliens. Later Prince Charles will visit the new headquarters of his charity, Prince’s Trust Cymru where he will meet volunteers, staff and young people. The Duchess of Cornwall will visit a shop in Porthcawl for the homeless charity Emmaus, of which she is patron. prince edward actually wanted to appear in the 1988 dr who serial’silver nemesis’,which was originally going to be filmed at windsor castle,but instead arundel castle was used-close to where i used to live! the doctor is bross wany A.K.A BATMAN! As my little bit of royal themed banter got a bigger response than I expected let me just say that I like the Time War Daleks but I also liked the original ones from the Patrick Troughton to Sylvester McCoy eras as well. And I also like the Paradigm ones and while the design may have had some amount of controversy it is still quintessentially Dalek. I think they should stuck to their guns on keeping only the Paradigm design for the Daleks that weren’t in the asylum as in the “City Of The Daleks” game and they would have gone down better if we had seen them more in action; particularly as it has been suggested the design concept includes at the back the possibility of hidden equipment and weaponry. Sometimes you have to move on with design concepts just as with cars, planes and the design of fictional Kaled mutation transporter units or fictional spacecraft like the USS Enterprise. I also like the original Star Trek USS Enterprise but compared to the Galaxy Class Enterprise D and Sovereign Class Enterprise E it still now looks aesthetically IMO more like an old banger. They also look better in that picture. 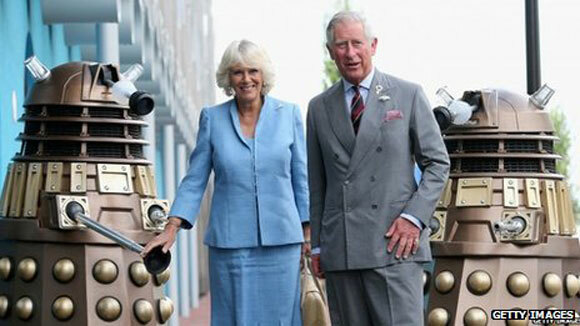 2 alien life forms posing as charles & camilla invade the tardis! Anyone else notice the floor around the Tardis Console seems to have developed spaces with about 50 holes in each one ?. Pause the video once it starts playing and look at the floor and you’ll see what I mean. That floor was not like that during this years episodes. Nice to see the Bronze Daleks out and about, the ol Paradigms just stood they lifeless hehe. Me too, but we are not the privileged Royals! Good to see Matt not fawning over them. I wonder will they write in why his hair is shorter or give him a wig? Amazing! They must have enjoyed themselves! Maybe it’s because the Time War design is more popular than their Paradigm commanders. The paradigm was there, you can see the gun and the shoulder f a strategist! But their the common Time War Daleks they’ve introduced to them and not the more Royal like pure DNA Paradigm ones.Total disintegration! Obliterate the unclean! This is a great photo of the Royals inbetween two Daleks. I the Daleks are making a plan with Prince Charles to form a government when he becomes King,lol.